Intel hopes to get back to advancing the chip manufacturing process every two years with the upcoming 7-nm process. The company hasn’t kept up with its own deadlines to advance chip technology and has dealt with embarrassing product delays. In recent years, Intel hasn’t been able to advance the chip manufacturing process on a regular two-year cycle, a schedule it had in place for decades. Intel has based its chip manufacturing advancements on an observation called Moore’s Law, which states that the density of transistors should double every two years while cost per transistor declines. Intel’s goal is to get back in line with Moore’s Law, which served the company well for decades. Returning to the Moore’s Law schedule hinges on a new technology called EUV (extreme ultraviolet lithography), which eliminates some of the complexity associated with making smaller chips. EUV could come into action with the 7-nm process. The technology uses ultraviolet light to transfer circuit patterns on silicon wafers using masks. EUV can’t be used now because the tools don’t exist. As chips get smaller, the chance of errors in the manufacturing process also increases. 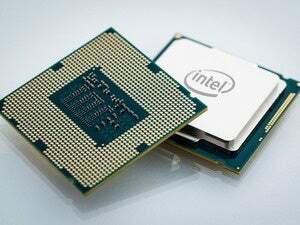 Current techniques like multipatterning lithography—used in Intel’s 14-nm process—do not allow Intel to further reduce chip sizes, Smith said. It’s possible that EUV tools will be ready earlier than expected so they can be implemented in the 10-nm process, but Intel isn’t planning for that yet, Smith said. Intel has lost the manufacturing advantage it had over rivals Samsung, TSMC and GlobalFoundries, but a move to the 10-nm process should put it on top again. Samsung and GlobalFoundries are now making 14-nm chips and haven’t shared plans to advance chip manufacturing processes.